Nigeria has been ranked 148 out of the 162 countries evaluated on the reduction of violence and insecurity between 2012 and 2013 by the Global Peace Index. This rating earns Nigeria the 14th fewer peaceful country around the world in the rank of countries like Chad, Yemen, Libya, Syria, and Pakistan among another conflict ridden states. According to the publisher of the Index, Institute for Economics and Peace-IEP, “The world has become a less peaceful place”. The 2013 Global Peace Index, ranks 162 countries by measuring security in society, the extent of conflict and the degree of militarization. This year’s report reinforces a longer-term pattern they have noted: since 2008, levels of peace have fallen by 5%. The report highlighted that while the number and intensity of internal conflicts have risen over recent years, hostility between states has fallen. In Nigeria, this is evident in the multitude of mindless killings and bombings in the North, untamed manhunt and kidnapping in the South, endless violence in the East and gross human molestation and abuse of fundamental rights in the West. From 2007 to date, Nigeria has consistently ranked low on the index, signifying worsening state of the nation in terms of peace and security in the past six years. The country ranked 117th out of 121 in 2007; 129th out of 140 in 2008; 129th out of 144 in 2009; 137th out of 149 in 2010; 142nd out of 153 in 2011; 146 out of 158 in 2012. Recently, A New York-based Human Rights Watch said about 3,600 deaths has been recorded since a radical sect dubbed Boko Haram began violent operations in the Northern region of the country in 2009. Although, government is now waging war against the insurgents through an emergency rule. With this rating as the 14th less peaceful country in the world, Nigeria, Africa’s most populous nation and one of the world’s largest oil producer has so much to contend in order to achieve its developmental goals. The global outlook indicated a dramatic rise in the number of homicides and more countries, 59, increasing their military expenditure as a percentage of GDP were the key drivers in making the world a less peaceful place, according to the 2013 GPI. This year’s findings were said to underline a six-year trend showing a deterioration of five per cent in global peace. 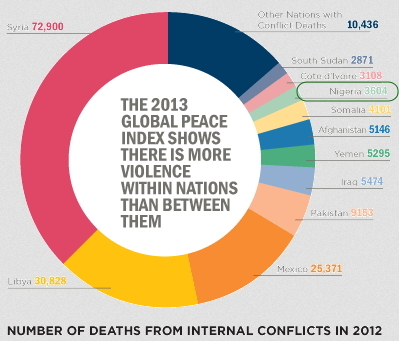 It indicated that 110 countries have seen their score deteriorate while only 48 became more peaceful. The economic impact of this five per cent loss in peace came with a cost to the global economy of US$473 billion last year, or the equivalent to almost four times Official Development Assistance (ODAs) in 2012; it unveiled. The sharp increase in the number of homicides – up eight per cent over the last year – can be nearly entirely attributed to Latin America and Sub-Saharan Africa with, for example, the homicide rate in Honduras further increasing by almost 10 per 100,000 people – becoming the highest in the world at 92 homicides per 100,000 people, the 2013 GPI revealed. Steve Killelea, founder and Executive Chairman of the IEP, was quoted to have said that, “The migration of populations to urban areas in developing countries has been a key driver in the rise of homicides worldwide. This has also led to an increase in violent crime. It is essential for the police to gain the trust of those living in city slums, to achieve this; addressing police corruption would be a first important step”. Nigeria indeed, journalist shout up ur mouth, nd write beta tinz.